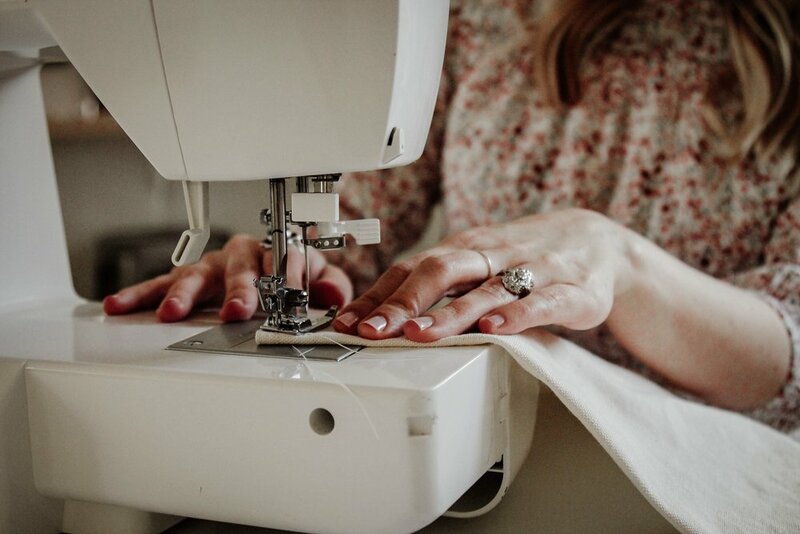 Kessler Patillo is a self-described aspiring minimalist, owner of the online shop Clover + Clementine, where she sells custom handmade goods for women and mamas, and a South Alabama-based wife and mother to 11-month-old, Birdie. 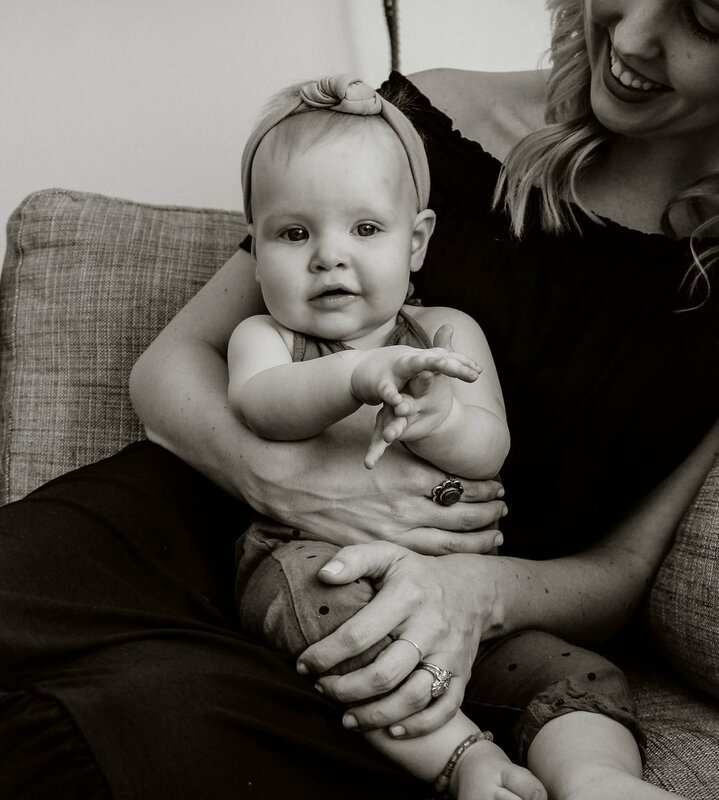 Kessler chatted with Motherhood Her Way about what minimalism means to her, family life, and how she's recognized that she's recognized that she can't have it all - and that's OK. 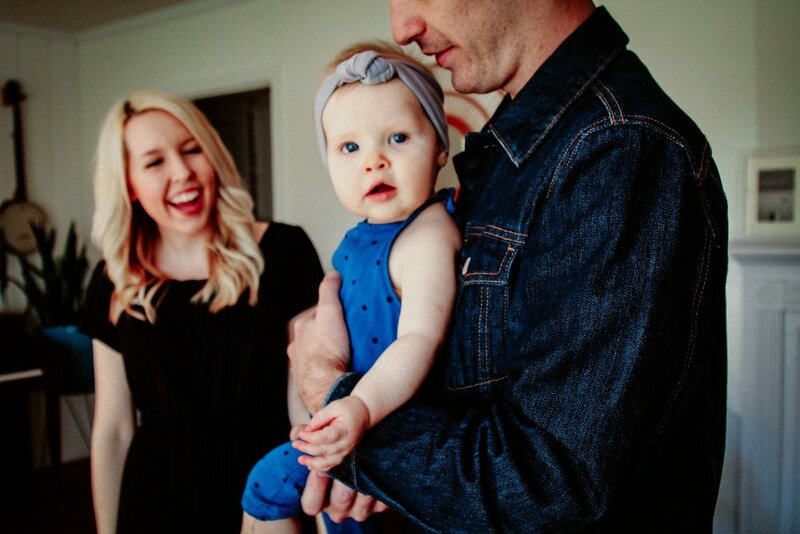 I live in South Alabama with my sweet husband Jacob and baby, Birdie. Jacob is a musician and super creative. We started dating in college and we are about to celebrate our 3rd wedding anniversary. Birdie is 11 months old. She is has a big personality, and is such a joy! We are also dog parents to two dachshunds. Clover + Clementine is my online shop where I make custom handmade goods. Staying in a basic daily rhythm is good for us, so most mornings begin with a big cup of coffee in a pretty mug and lots of playing with Birdie. When she goes down for her nap, I answer emails and get the majority of my work done. When she wakes up, she likes to help me run errands or do whatever I need around the house. When Jacob gets home, we all hang out in the kitchen while preparing dinner or go on a walk if it is nice out. What inspired you to start your shop, Clover + Clementine? I created a little graphic map of my neighbourhood to have as a print in my home. A friend suggested I put it on a shirt and a local store picked them up. I had so much fun with the whole process, I decided to make it into something more, so I created Clover + Clementine. I got on Instagram, made a website, read a whole lot of blogs about how get started and it has just been a fun little roller coaster ever since! For me the most challenging part has been figuring out the behind the scenes stuff. When it comes to business, I did not know what I was doing (who am I kidding, I still have no idea what I am doing)! Figuring it all out as I go has been fun though. I have learned so much in the past year, as well as made my fair share of mistakes, but it has all been so worth it. I get giddy every time I make a sale, and thanks to social media I get to see Clover + Clementine products in people's homes. That is the best part! I love all the connections I have made along the way. What is your favourite item in your shop for moms? I am super obsessed with the banners right now. I have gotten to create several custom banners for moms, and that is so special! What is your go-to mom style when you're hanging out with Birdie? Even if I don't have anywhere to go, on a given day, I still feel best when I get ready and wear something that I feel good in. I love comfy boho style, so dresses, jeans, sandals, and something flow-y is my usual go to. I also love a good tee and jeans! Describe your take on minimalism and how you live an intentionally minimalist lifestyle - especially with a young daughter! Minimalism has been intriguing to me for the past several years. The KonMari method is amazing and I have relied heavily on the question, "Does it spark joy?" throughout the process. With the addition of a baby, I have become even more diligent on my journey to minimalism. And please hear the emphasis on *journey* because I am still learning, and not yet where I want to be. As a mom, I hit a place where I struggled with time management. I felt like I was drowning in clutter and to-do lists, and never getting anywhere. I am finding that living with less gives me more, and that is freeing. What are your top tips for others looking to adopt a more intentionally minimalist lifestyle?Reading books like The Life-Changing Magic of Tidying Up: The Japanese Art of Decluttering and Organizing by Marie Kondo, Present over Perfect by Shauna Niequist, and Lagom (Not Too Little, Not Too Much: The Swedish Art of Balanced Living by Niki Brantmark have been huge influences as I am figuring out what minimalism and intentional living looks like for me. A common thread in these books is figuring out the end goal first, then figuring out the way to get there. We have all stood in front of our closets with a garbage bag and removed a few things that we don't use anymore, but for me minimalism has not been about discarding. Minimalism has been about what I choose to keep and how I choose to live. I am trying to keep it simple while still feeling cozy and comfortable. Another tip is find community as you go throughout the journey. I have read these books along with friends and we encouraged one another and learned from each other along the way. I think accepting the fact that I can't do it all has been the hardest part of this whole motherhood thing. I have learned it the hard way, but I am starting to realize that every time I say "yes" to one thing, I might have to say "no" to something else... and that is okay. My shop is a big part of how I recharge. I love to grab a cup of coffee and my computer and start creating. I also find that taking the time for prayer and reading the Bible is important for me. Even if it is only a few minutes, it is still a big part of staying grounded! As a mom, I am so inspired by other moms on Instagram. I know people always talk about the comparison trap of social media, but I love seeing the highlight reels from other moms. Those little moments are special and a great place encourage one another. Thank you so much, Kessler! Visit her shop, Clover + Clementine, or say hi on Instagram @kesslerpatillo.